As we glide gently towards November, there’s still plenty of entertainment in the ever-changing world of the waterways. 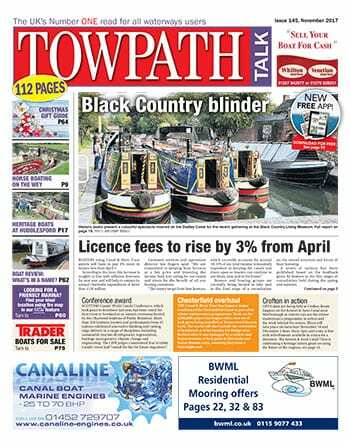 Not least in Towpath Talk, which is not only available as a free newspaper at a host of outlets along the waterways system, but also in digital fashion too. In the latest issue, editor Janet Richardson and her crew have been out and about, making the most of the autumnal shows and events before the curtain falls on them for another year. Among their ports of call were Grantham Canal Society’s annual Discovery Day, the biennial Huddlesford Heritage Gathering on the Coventry Canal, the 10th annual Coracle World Championships on the Severn in Shrewsbury, Hayes Canal Festival, Tapton Lock Festival, Sheffield Waterfront Festival, Alvecote Marina’s ‘One Big Weekend’ event and the biennial Black Country Museum gathering in Dudley. What could be nicer, if you love the feel of the printed word on your fingertips, than settling down, now the nights are rapidly drawing in, with a cup of tea or coffee, and browsing the November issue? 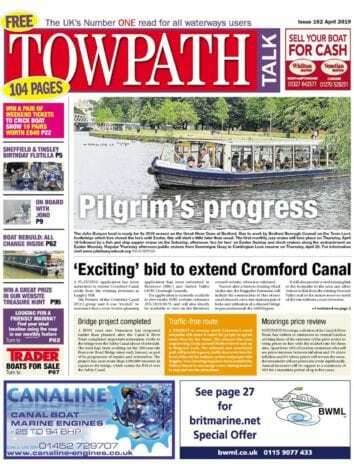 There’s news from Irish and Scottish waters, ideas for holidays and places to eat out, and the chance to sit and daydream about the spring and summer of 2018… and if you’re looking to buy a boat, or trade yours in for an upgrade, there are pages packed with super boats to compare and contrast. 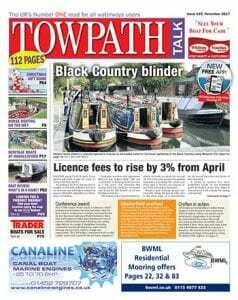 In a new series of articles, exclusive to the Towpath Talk app, we delve into the 120-year archive of The Railway Magazine for an in-depth look at the relationship between Britain’s railways and canals.